How did a city boy born and raised in Cleveland, Ohio become involved in the auction business? For some strange reason, I always liked old things; unfortunately, that now includes me. Even growing up, I took an interest in my grandmother’s keepsakes that my mom had tucked away in her closet. To this day, I still have those keepsakes. Then as we all know, life goes on and I graduated with a BA from Bowling Green State University and while finishing my Masters in Education and Supervision at BG, I began my teaching career—first in Cleveland, then Toledo, and finally in Plano, Texas. I moved back to Ohio in the mid 70’s and became a mfg’s. rep. and then moved to Columbus in the late 70’s to accept a management position with Lazarus and eventually bought my first old house in Clintonville which my kids considered the “haunted house.” My family in Cleveland just shook their heads. It was at this time that the antique “fever” began. I returned to education in the 90’s and currently teach at a local university in the field of Communications and reside in another old house in Canal Winchester. After years of collecting, I was convinced that auctioneering would be a great way to segue into “retirement.” I, therefore, attended Mike Brandly’s Ohio Auction School, apprenticed under Tom Rawn, and obtained my Ohio auctioneer’s license. In addition to establishing my own auction business, I am very fortunate to be a part of Mike Brandly’s organization, helping call on his Wednesday auctions at his auction house in Groveport, Ohio.. I am equally fortunate to call auctions for Lou Daniels at his American Eagle Auction House in Circleville, Ohio. Well, there you have it, a “brief” autobio. 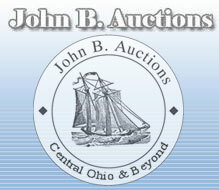 Of how a city boy from Cleveland became an auctioneer in Canal Winchester, Ohio. I hope you will consider me for your auction needs and thanks for viewing my site.